April 28, 2004! More updates are at the bottom of the page! we just bought our latest toy. 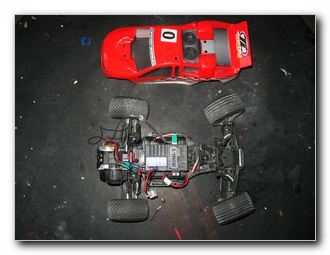 A Team Losi Mini-T and I rememebered all too well the nice things that running r/c cars come with! This was actually our present to our son Jason, seen above, for his name day celebration, which is tomorrow on April 29. 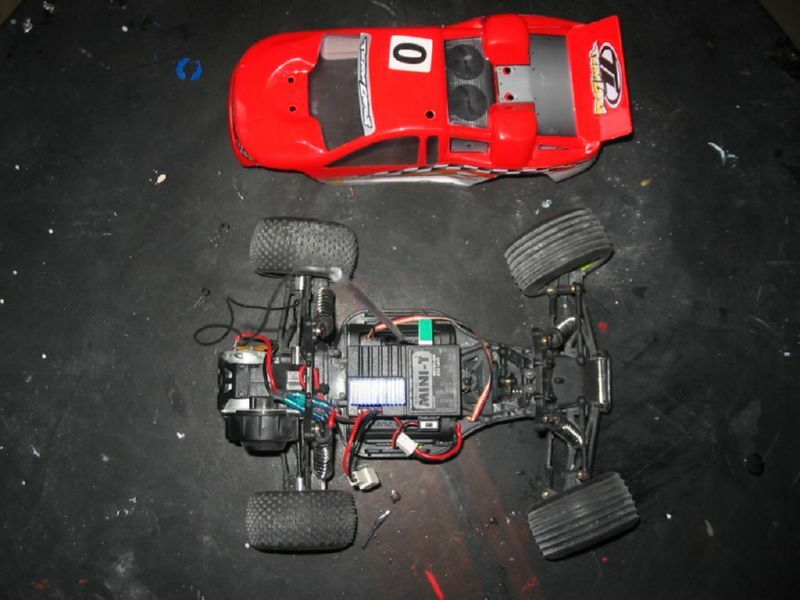 Looking at the model from an r/c car modeller and racer's view, I have to say a few (good) things about this kit. 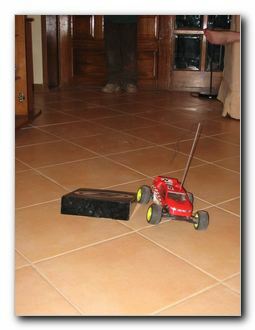 The Mini-T was bought from Model Mania at Kallirois Avenue, and in fact it was the last one they had. A previous phonecall to the importers DSAW Hobbies revealed that the Mini-T is quite a strong seller and it would be difficult to track one unsold, quite quickly! However, they gave me the phone of Model Mania and two hours later I had the kit box tied on the back seat of my motorcycle! 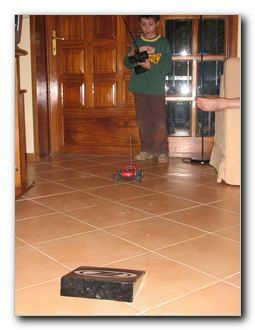 The contents of the box were just two: A preassembled, painted and decorated Mini-T and a pistol grip transmitter. All that was needed was a lot of AA batteries, 12 in total: 8 for the Tx and 4 for the car. Mr. Antzoulatos of DSAW-Hobbies assured me that there are available micro battery packs to save one from charging overnight the AA's. Also, these packs would be of 7.2volts, giving the little truck that extra oomph, not that it really needs it! Oh, there was also an exploded diagram of the car, as well as detailed instructions for absolute beginners. 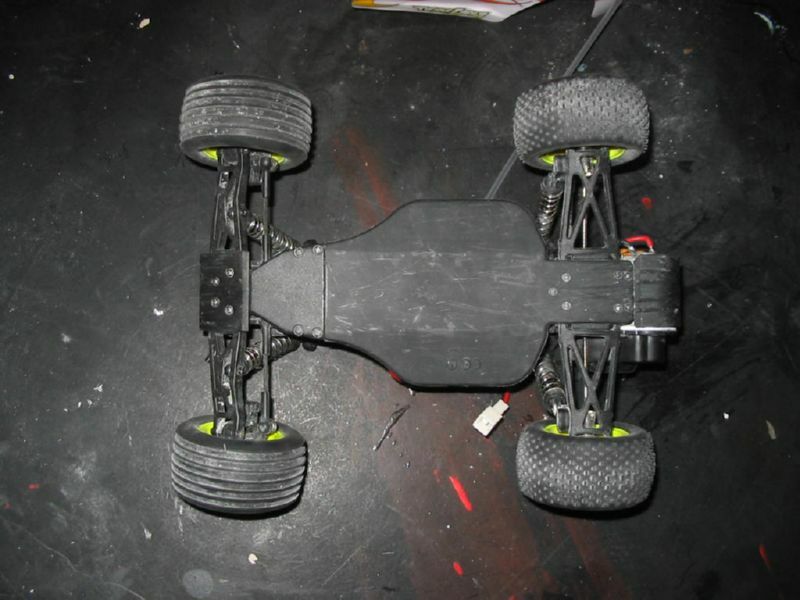 Oh there was also this black carton with the TL logo on top, destined to make an impromptu indoor ramp for jumps! I was amazed. And so was Jason! I needed to do some closer investigation this evening, so AFTER Jason went to bed, I managed to sneak into his room and "steal" the Mini-T form under his pillow for further visual evaluation. During the day, he would barely let me drive the truck! At first he was quite clumsy with the controls, leaving the steering to use the reverse or brakes, or using one control at a time: Either steer or throttle! 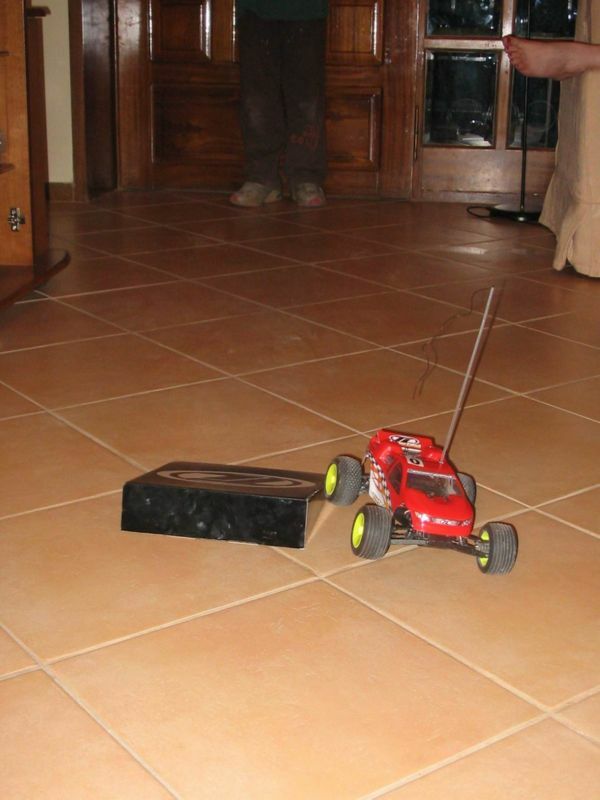 However, by the end of the first set of those 1850 NiMH's he was quite comfortable to cruise around in the house, under the dinner table and around the chairs without hitting the truck around. Duration with these 1850's was estimated at over 90 minutes of running around in the house and in our back yard. The next set of 1000mah's are still in the truck and going strong after playing for over 45 min. indoor (read: living room, annoying our cats!). Talking of hitting, I was left amazed at how sturdy this little monster is! It still ahs not broken anything, and after a thorough cleaning by Jason, it looks brand new and with almost no scars at all! 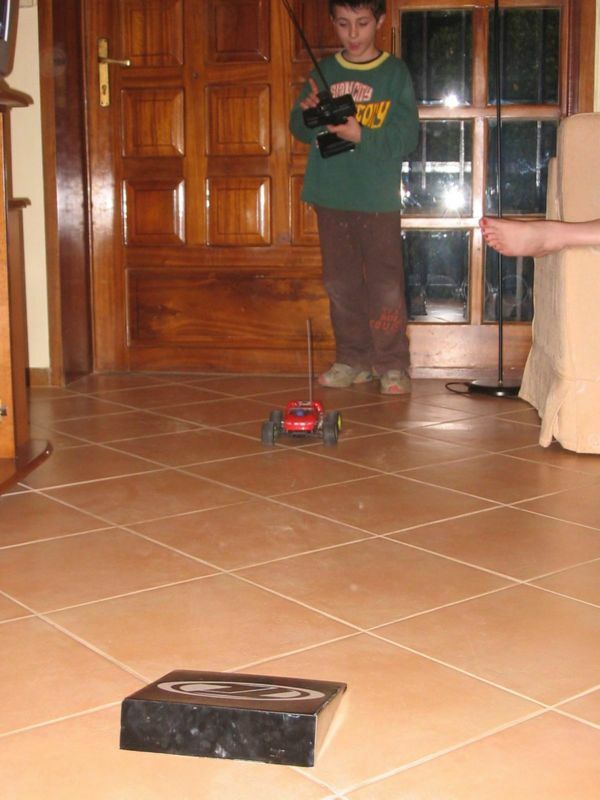 After all, it's his first real r/c car, even though it's small. Everyone seeing it for the first time, think it's one of those 30 euros toys sold in toy stores. I believe it really is worth every penny it costs. 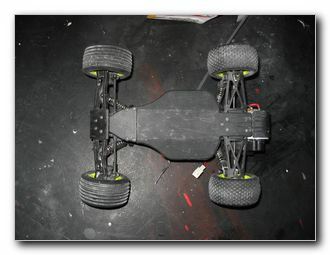 The construction of the Mini-T has nothing to envy from the normal/regular 1/10 r/c trucks. Maybe there's one thing missing, and that's oil shocks. 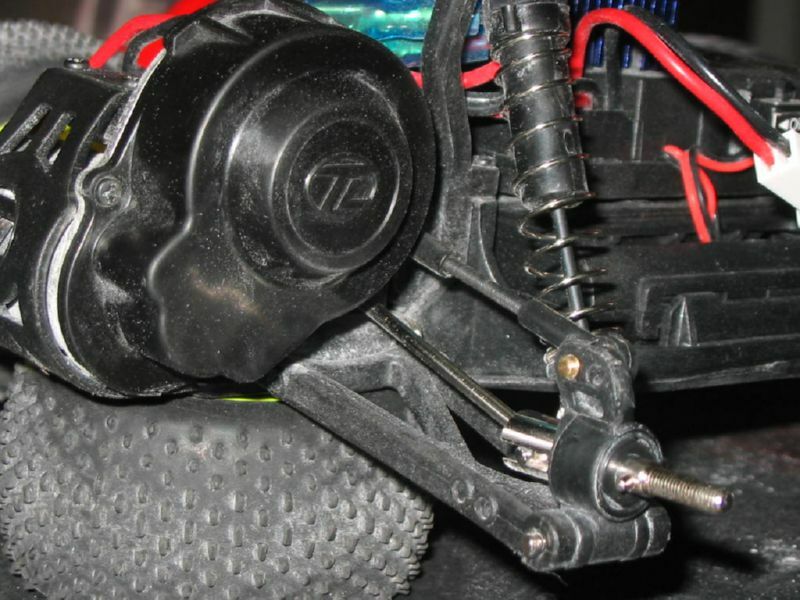 However, even with the friction shocks, the Mini-T can outhandle its novice commander! Everything on this truck is scaled down from the 1/10 truck. 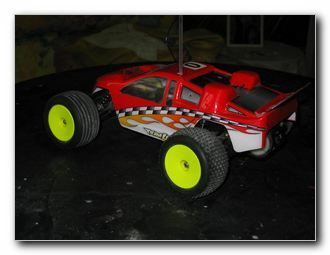 The quality of parts, fit and finish is impeccable, and I'm sorry to say this is the first ever Losi car I'm buying. 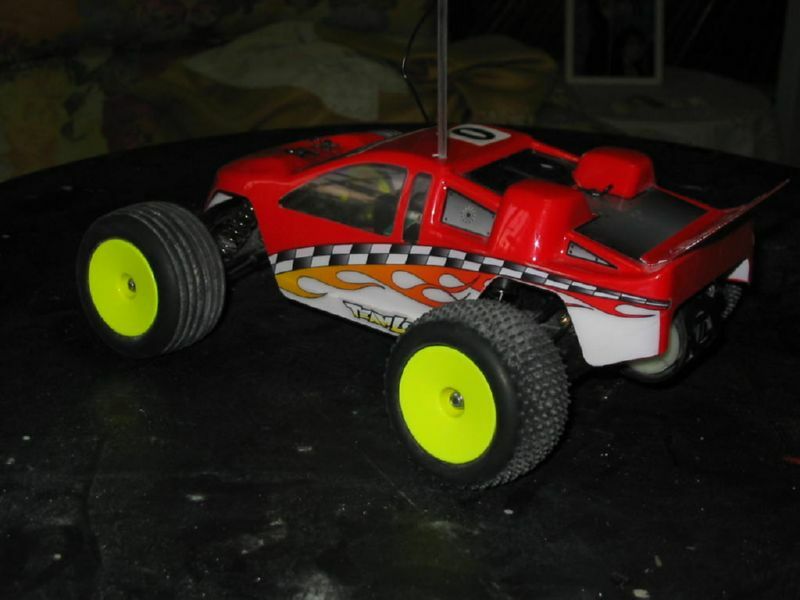 You see I've always drooled after the Losi 2wd buggy and the truck, for years now! At last the chance came to have one in my hands, even the smallest of their line! 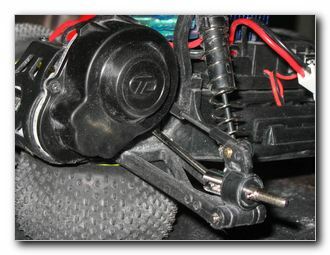 The elctronics supplied remind me of the Kyosho/Futaba unit used in the 1/8 r/c motorcycles, only it looks a little bigger, has a cooling fin on top, and the steering servo is the tiniest one I've ever seen in my life. 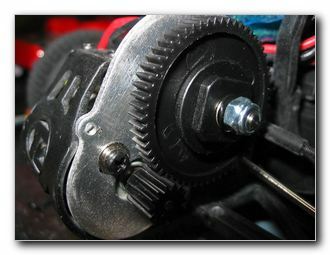 There's even a slipper clutch on the spur gear. One more thing missing is a charging jack for the transmitter. Am I asking too much?!!!!! Update May 19, 2004: We took a LOT of wheelie pics and Wheelie VIDEOS! 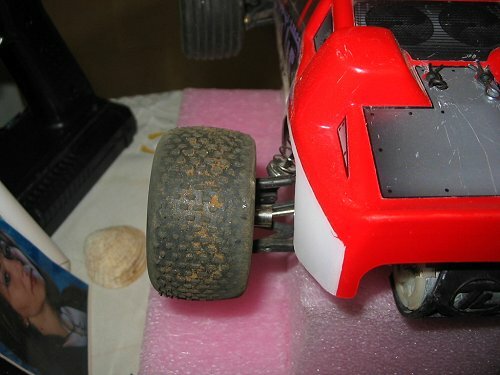 This is what happens to rear tires after countless wheelies!!!!!!!!! Clicking on each thumbnail above will guide you to an 800x600 pic. Clicking on links it will open them in a new window. 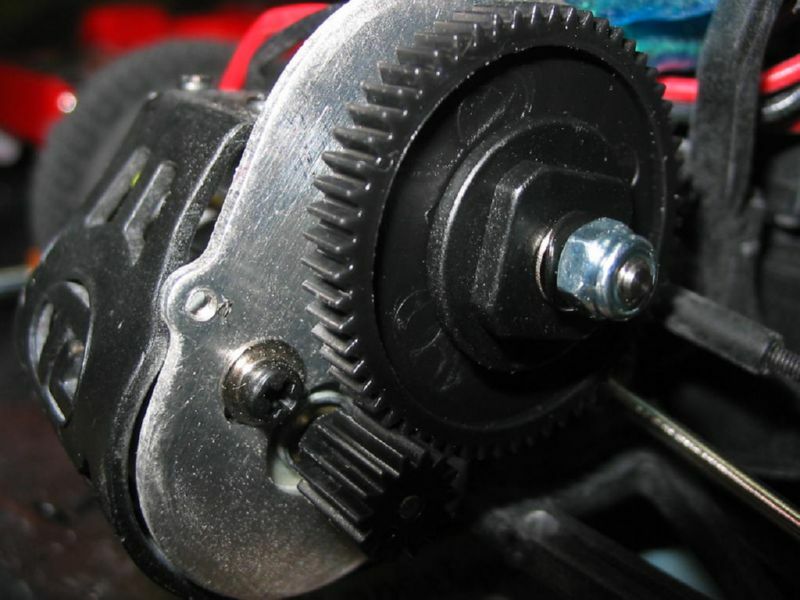 Update October 31, 2005: New Gears and a ball diff!